Welcome to Farmer's guest house Bed&Breakfast Dan!! Spring has come. You can gather edible wild vegetables until late May. We’re fully booked for the whole month of July so we can’t have a reservation for you on July. Please come to our guest house to avoid summer heat on August and September. Please enjoy Miyama’s ayu (sweetfish) during summer. October is the season for Tanba matsutake mushroom. We’re looking forward to meeting you. ※Dinner is available by reservation. You can also have a farming experience a little.If you’d like to do that, please tell us! 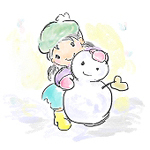 Let’s play in the snow in winter in Sasari! You can enjoy the outdoor activities!!! There used to be a ski resort in Sasari, where is the different world only 1 hour from Kyoto city! You may wake up to find all around the house filled with snow by chance. You can play by doing things such as playing with snowshoes on, making snowmans and tracking the animal’s footsteps remained in the snowfield.You can enjoy playing especially from the late December! !